Every day, Watch This offers staff recommendations inspired by a new movie coming out that week. This week: The shabby Dumb And Dumber To has us thinking about better films starring famous comedy duos. 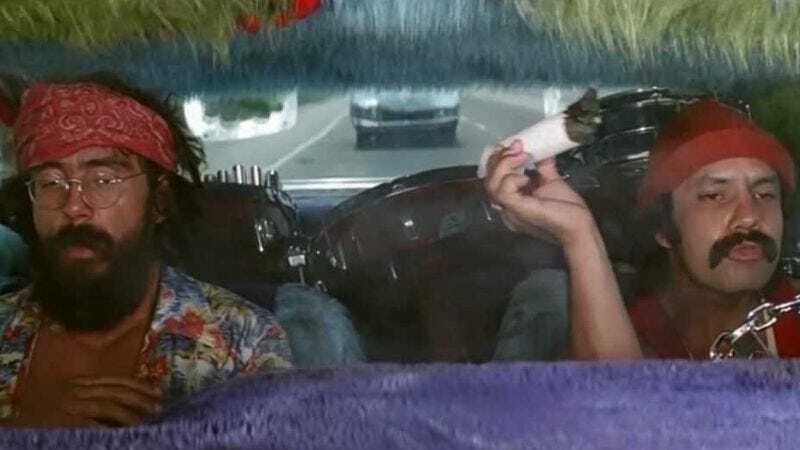 The high priests of getting high, Cheech & Chong make an auspicious big-screen debut in Up In Smoke, a stoner comedy of epically far-out proportions. Rambling along like an amiable stoner’s stream-of-consciousness story, Lou Adler’s ramshackle film concerns the misadventures of Pedro De Pacas (Cheech Marin) and Anthony “Man” Stoner (Tommy Chong) after the former picks up the latter hitchhiking, and they proceed to bond over a gargantuan joint that Anthony made with a combination of grass and “Labrador”—by which he means the droppings of his dog, who’d recently eaten his stash. It’s an absurdist intro to what soon reveals itself to be a winding, episodic saga in which the two find themselves in one ridiculous scenario after another, from trying to buy some pot from a Vietnam-vet dealer (Tom Skerritt) suffering from PTSD, to trying to sneak back into the country from Tijuana in a van literally made out of weed (a scam that inadvertently comes to involve framing a group of nuns), to regularly attempting to evade Sgt. Stedenko (Stacy Keach), who’s the epitome of bumbling-square cluelessness. Structured as a series of vignettes in which the heavy-lidded protagonists stumble about in search of their next score—and, ultimately, some time alone with a couple of beauties they also pick up on the side of the road—Up In Smoke proves to be a movie tailor-made for those under the influence. Disinterested in anything other than outlandish drug humor, the film has an easygoing charm that comes, mostly, from the ludicrous back-and-forths of its headliners. A couple of equally slow, hazy doofuses, huckster-wiseass Cheech and obliviously dense Chong are counterculture clowns who continually succeed in the face of trouble through sheer devil-may-care confidence and laid-back attitude. Their tale is one of marginalized outsiders triumphing against the repressive, humorless system, and remains a classic of the pot-movie subgenre thanks to the chemistry of its loopy leads. Availability: Up In Smoke is available on DVD, which can be obtained from your local video store/library, and to rent or purchase from the major digital services. It’s also streaming on Netflix.